Creating Polygons shapes on digitized lands is easy as we already have some tutorial created for creating polygon with leafletjs. 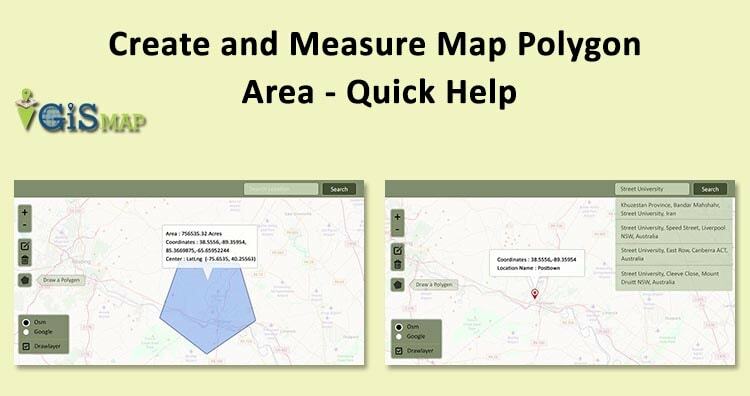 But ever wondered what should one do when they need to Create and measure Map Polygon area? The solutions for small challenges like this, which appears to be big for developers who didn’t worked on GIS earlier, is what we are providing here at Engineer Philosophy Web Services. This case happened when one of the United States based ERP company, which operates in multiple countries, wants to provide a small GIS solution to be intergrated in their existing ERP system to their fertilization and agricultural sector client. As their client need a quick POC (Proof of concept) to digitize their land and calculate area in acres, they need a quick solution to be created. As their team is not expert in GIS and doesnot know which technology to opt for, they approached us around mid-night through our website chat box, as we provide 24/7 assistance with chat at our website. Quickly after talking to us and checked our ability, they turned to our GIS Consultancy Services, which helps them in getting solutions and consultant related to leaflet, geoserver or any other GIS related issues. Being a large ERP organization which operates with fertilization and agriculture clients to deliver and support its services to end user. Given the immediate nature of on-demand services, they expect instant support and exceptional services from us. This created a colossal consumer service challenge. They needed assistance on setting up basic mapping within their .Net application which will then can be incorporated into the ERP system. They needed tool for measure the polygon shape area that their clients will map on digitized lands from the ERP. The Company also required an add-on, i.e. Geocoding along with maps, which can provide geographical coordinates corresponding to a particular location or address which their client might type in to search their address. The company decided to go with Leaflet.js, as it is open-source which saves them a reasonable amount of capital. Initially we used the Leaflet.js Draw plugin to create and digitized polygon which can be digitized, deleted and edited easily. We also used Turf.js for evaluating the polygon area drawn on the digitized map because it gives more approximate results then the Leaflet.js Draw plugin. When the company decided to go with the open source software, we again provided them with two options in their best interest i.e. MapQuest API and MapBox API for Geocoding purpose. Once we are done with coding part in next 3 hours, we showed the solution to the organisation. Get the feedback corrected some User Interface stuff and provided code to their developers. In an 1 hour we helped them to understand the code and integrate the same with their system. We provided solutions for every concern related to map and gis challenges to the ERP company developers. Provided hands-on assistance in setting up basic mapping within their .Net application which will then can be incorporated into the ERP system. 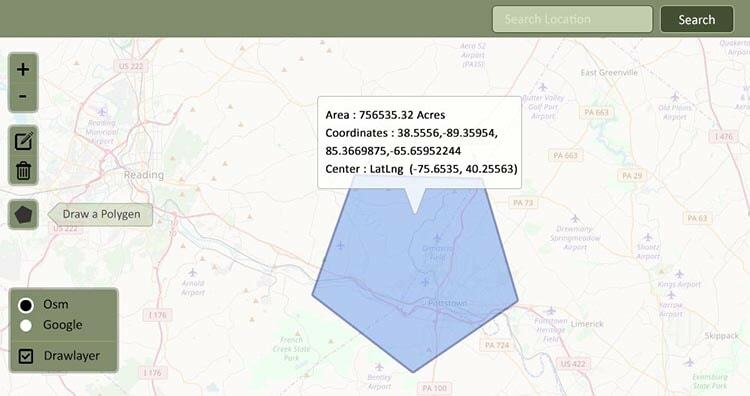 Consultancy and hands-on assistance with evaluating polygon area on digitized lands with Leaflet.js and the same saved polygon should be reopened and edited from the system. 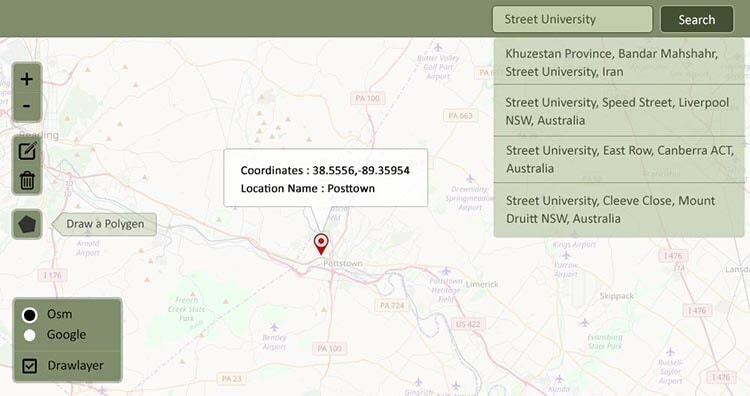 Provided wonderful tool for Geocoding along with the maps and assistance on implementing it. We here at Engineering Philosophy Web Services provides Services and Consultancy related to Leaflet.js, Geoserver, Geocoding, Web/App development and Other GIS tech factors.